Our January issue of CAESTUS (subscribe here) went out this week, and here is just a taste of what you missed. Even for boxing, long “The Outer Limits” of the sports world, Adrien Broner is unique. “The Problem,” who faces creaky Manny Pacquiao on Saturday night in a pay-per-view pseudo-spectacular, is the only fighter in North America whose major selling point is a criminal disposition. Out-of-the-ring drama, propelled by an active Instagram account and all-in coverage by TMZ, is all that keeps Broner relevant. He is, for prizefighting, the embodiment of the term famesque. Over the last twenty years, only Mike Tyson—disaster personified—and Tony Ayala, Jr.—who once entered the ring wearing an ankle monitor—can compare to Broner. But Tyson had already built a legendary career by the time he became a sideshow attraction, and Ayala was looking to fulfill the promise of an earlier era, before his bloodlust led him to prison. In other words, both fighters had accomplished pasts before going off the rails. To this day, Broner, despite his dubious standing as a four-division champion, has defeated only a handful of notable fighters, some of them by the narrowest margins. 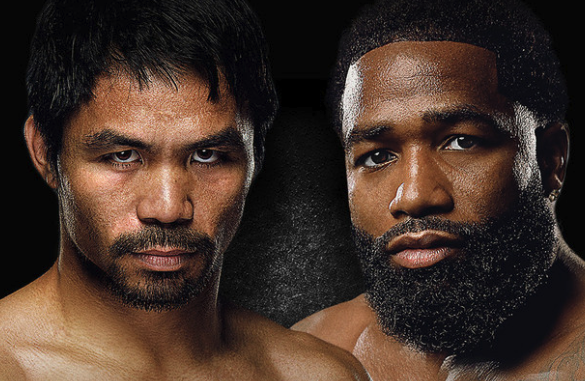 When Broner and Pacquiao square off, it will be as symbolic representatives of the future and the past, respectively. If Broner is the first of the famous-for-being-famous pugs in the digital age, then Pacquiao may be the last of the genuine prizefighters, a man who sparked his own fortune between the ropes. To read Pacquiao and Broner, Past and Future Unwittingly Collide, subscribe to the Hannibal Boxing newsletter below! In addition to The Hit Parade, CAESTUS features links, videos, and the latest news from our book publishing imprint, Hamilcar Publications.